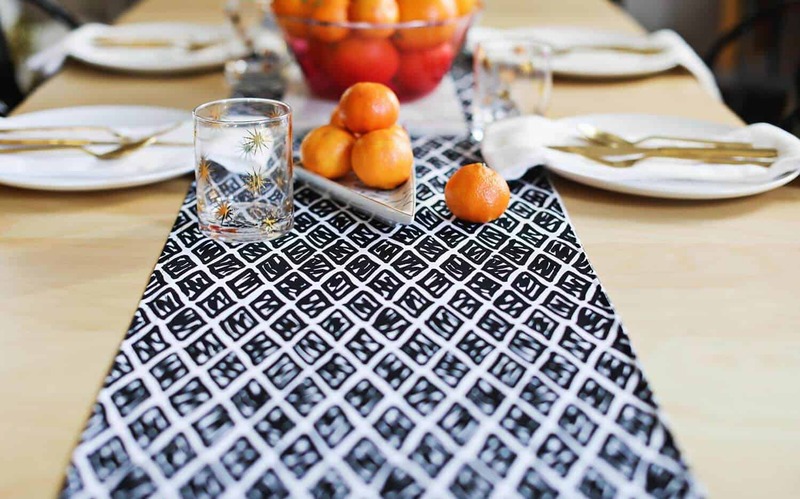 Table runners add an extra layer of color and pattern to any table setting. 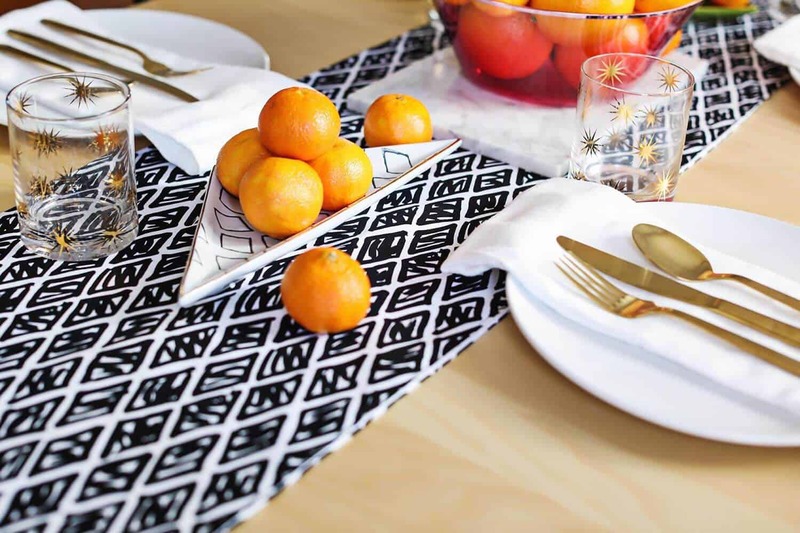 While they are usually reserved for more formal occasions, having a table runner or two that works well with year round decor can make everyday meals feel a little more special. 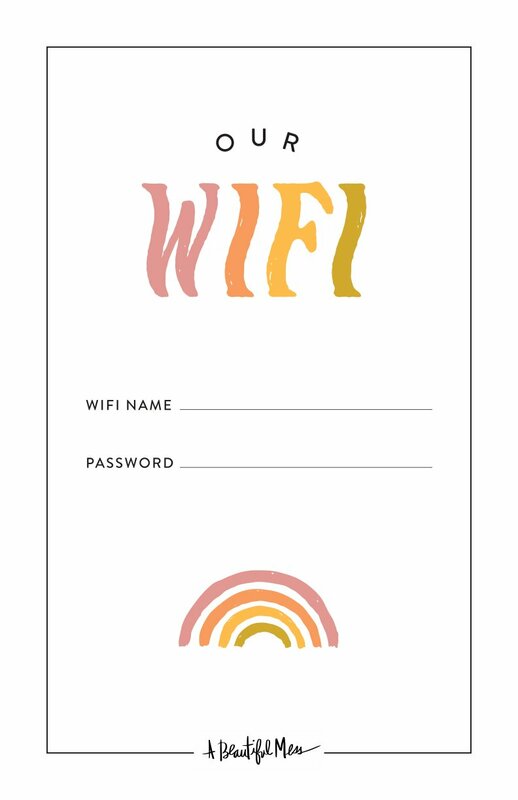 It’s also an inexpensive way to hit the refresh button on your dining room! This tutorial is very easy to use if you’re a beginner and can be adjusted to create coordinating placemats. If you’re feeling brave, you can even customize your table runner with pom-poms or fringe at the ends for an even more boutique-like look. Since this is such a long and narrow project, I’ll be sharing a sample size so you can see the entire perimeter of the project at once. It is not to scale—it is so you can better SEE how to recreate this project at home. Our table is 6′ long so I designed my table runner to measure 8′ long. I prefer a table runner that drapes over the ends, but you can also design yours to be the kind that doesn’t reach the ends. Just shorten your length to the length you desire plus two inches. Prewash and dry your fabric to preshrink it. Iron it flat. 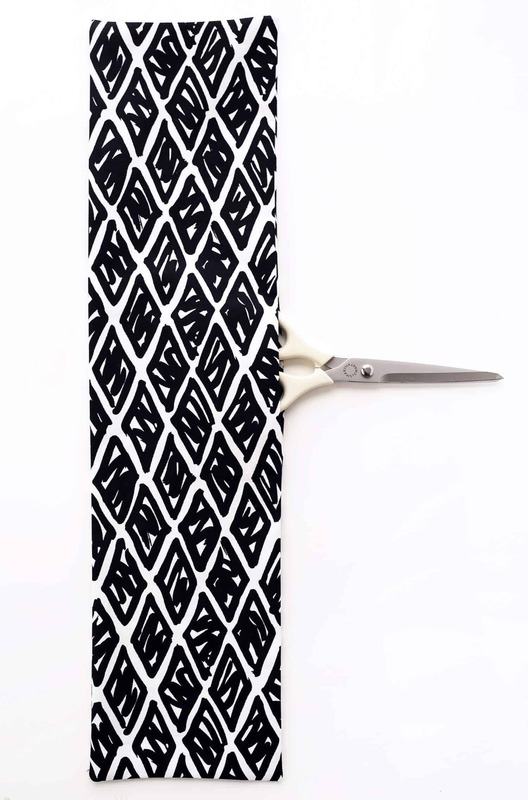 Cut out two lengths of fabric measuring 15″ x 98″ (or the preferred length for your specific table shape). 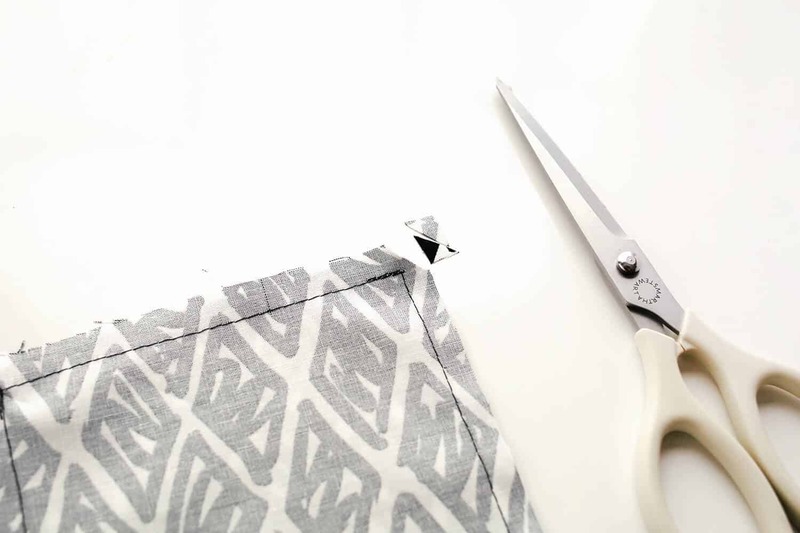 Step One: Once you have determined size and cut the fabric, place the two right sides of the fabric on top of each other while making sure your edges are flush. 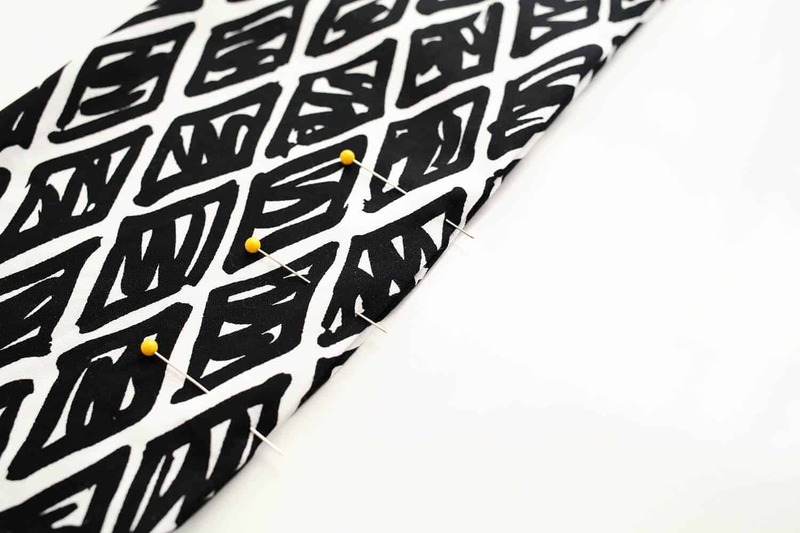 Pin around the perimeter of your table runner with straight pins, about 5″-6″ apart from each other. Step Two: You will want to leave an unpinned space that is wide enough for your palm to fit through on one of the long sides. Place your table runner under your needle, lower your presser foot, and start with a back stitch. 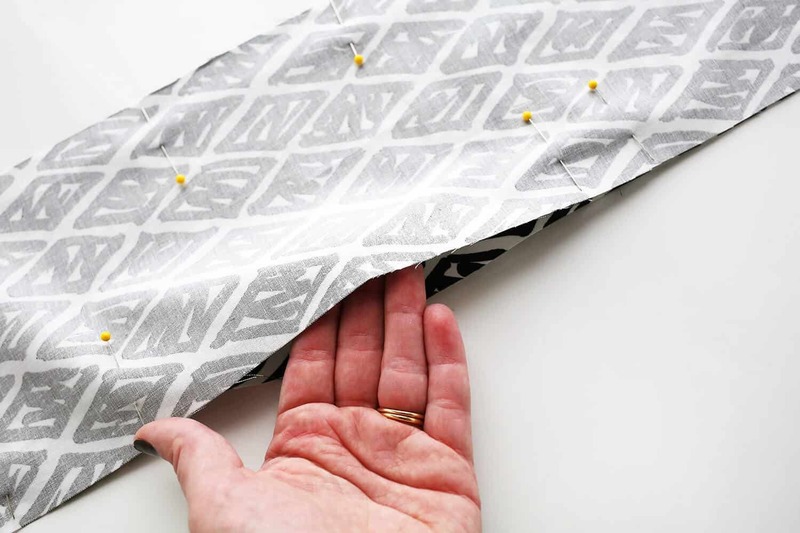 Then continue stitching along the perimeter with 1/4″ of space between your stitching and the edge of your fabric. Raise your presser foot when you come to a corner and turn your entire table runner at a right angle so that you can continue stitching along the perimeter. You can see I started stitching on one long side but not quite near the middle. Then I left about a palm’s worth of space between where I started and where I stopped and ended with another back stitch. Step Three: Trim off your corners but be sure not to cut too close to your stitching. This allows some breathing room for your fabric when you turn it right side out and makes for sharper corners. Step Four: Turn your fabric right side out and poke your corners out with the blunt point of your scissors or the eraser of a pencil. You don’t want to puncture a hole through it, but you do want to apply some pressure. Press your fabric as flat as you can to regain its shape and then iron flat on a steam setting. The scissors are placed to show you where the unstitched gap is for reference. Step Five: Pin your gap closed so that the ironed hem is tucked inside for a clean line. 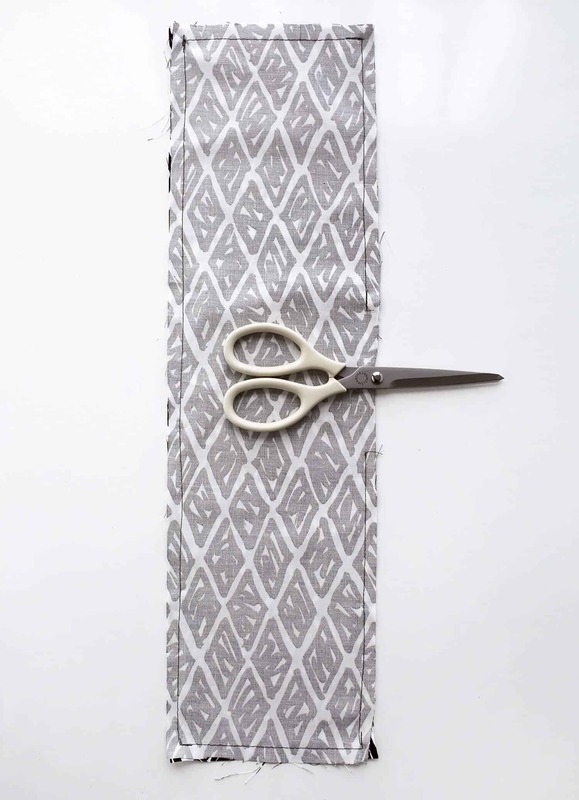 Place your table runner back under your needle, lower your presser foot, and stitch around the entire perimeter again with 1/4″ of space between the stitches and the edge of your fabric. 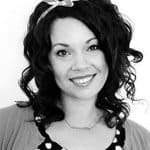 This will naturally close your gap and will provide a finished look to your project. 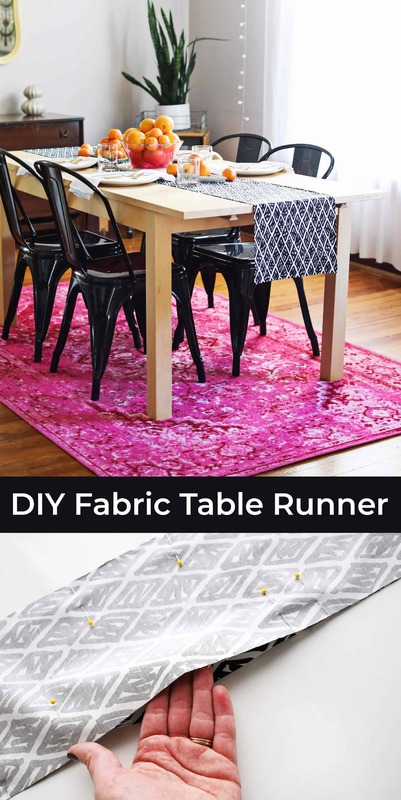 Iron your table runner and enjoy how much more styled and layered your table feels! Credits // Author: Rachel Denbow. 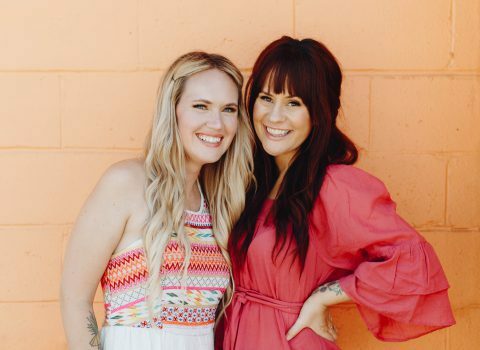 Photography: Rachel Denow and Janae Hardy. That looks so good, I love the idea of making this yourself! Oh my goodness- didn’t even think of MAKING one when I was on the hunt recently. I tried 15 different websites trying to find “the one” and settled on one I’m so-so about from West Elm. Thanks for the idea and tutorial! Definitely will use it when my so-so one gets stained and I need a refresh! THIS is the reason I ever make stuff. It’s so hard to find something special (at a price point I like)! I hope you get a chance to make one soon! What made you decide to sew it double sided? 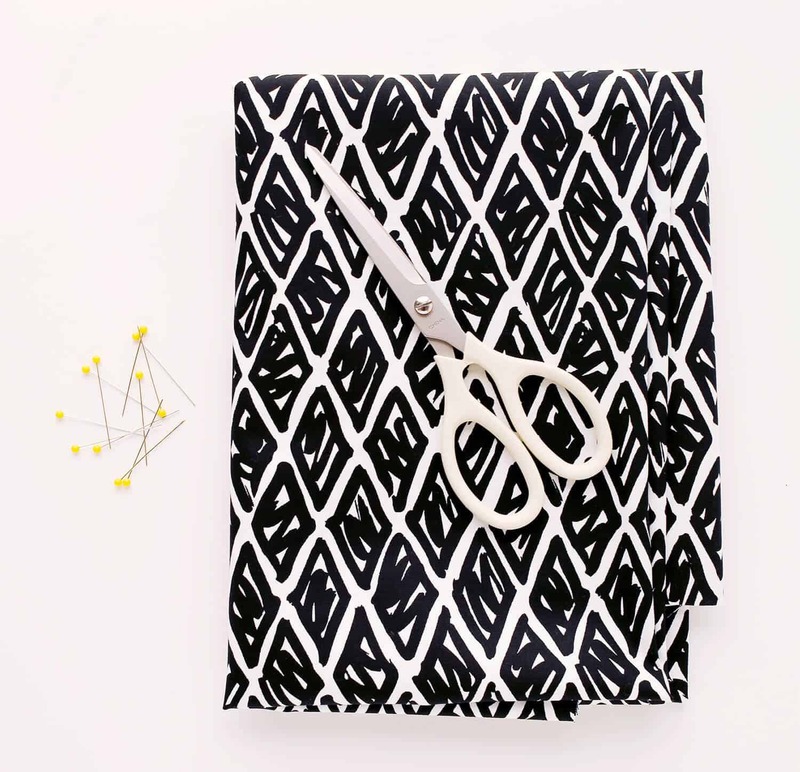 If I were making one I would just hem the edges like I was hemming a napkin – fold it under twice for a neat finish. Good question! I think it makes it feel more substantial and has a little more structure to it. It could also be an easy way to make it reversible if another print was used on the back side. Oh my GOD I was literally JUST looking for a tutorial on DIY table runners!!! It’s impossible to find the perfect one. I’ll be heading to JoAnn’s after work for some fabric. This is great – thank you guys!!! This table runner is awesome! You did a great job! I love the pop of color with the pink rug! This is really inspiring as I’ve been wanting to make a table runner sometime myself, thank youuu! 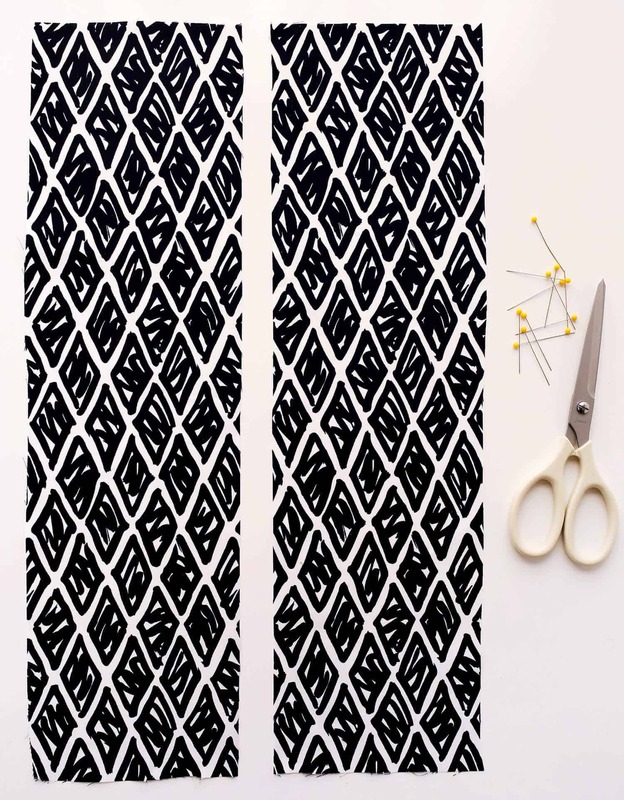 Table runners offer a quick and simple way to jazz up the décor in your kitchen or living room. This do it yourself option is fun and modern, and since it is black and white, it tends to go well with a variety of decorating schemes. I love your industrial chair ! They are really beautiful!